The essence of critical thinking concepts and tools written in language accessible to children. This mini-guide is designed for K–6 classroom use. It explains basic critical thinking principles to children using cartoon characters. It focuses on the concepts of fairmindedness and selfishness, the elements of reasoning, intellectual standards, and intellectual virtues. VIEW THE INSTRUCTIONAL VIDEO OF THIS BOOK *** DVD version of this video available soon! This book is presented in five parts. Each file is an mp3 that can be played with most audio programs. 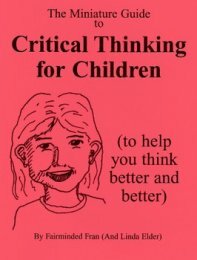 Why A Critical Thinking Mini-Guide For Children? From a young age, children are capable of learning some of the foundational critical thinking concepts and skills. Though they are largely egocentric, children can nevertheless begin to think about how their behavior affects other people. They can begin to take thinking apart (to focus, for example, on purpose, questions, information, inferences, in thinking). They can begin to apply intellectual standards to their thinking (such as clarity, accuracy, relevance, and logicalness). They can begin to develop intellectual virtues (such as intellectual perseverance, intellectual humility, and intellectual integrity). The Miniature Guide to Critical Thinking for Children introduces children to some of the most basic concepts in critical thinking, making these concepts accessible to them through simplified language. The simplest way to use the guide is to foster student questioning using the model questions throughout the guide. If teachers routinely ask these questions of their children and regularly encourage children to ask these questions of their classmates, they will be pleased with the results. Thinking is question-driven. When children have no questions, they have no motivation to learn, to inquire, to discover. When teachers regularly focus on the questions in The Miniature Guide to Critical Thinking for Children, students learn to formulate questions that improve their learning. Teachers who use the guide may also be interested in obtaining its accompanying Teacher’s Manual. The manual provides suggestions for using The Miniature Guide to Critical Thinking for Children and for teaching basic critical thinking concepts. It also contains "Think for Yourself" activities for children to help them internalize critical thinking ideas. Companions to this mini-guide are 1) the set of masks of Fairminded Fran, Selfish Sam and Naive Nancy and 2) a children’s book that introduces the concepts of fairmindedness and selfishness. I did not formally assess your materials, however, I thought you might be interested to know that I did take them to my critical thinking class. It is an MA class and most of the students are teachers. At the time we had already covered the elements and standards in the class and we had done quite a few activities with them. We were using the text, Critical Thinking: How to Prepare Students for a Rapidly Changing World. The students were extremely enthusiastic about the following: Critical Thinking for Children, Critical Thinking, and How to Study and Learn, in that order. One of my students was especially enthusiastic about Critical Thinking for Children and plans to base her whole curriculum on it. She teaches 4th and 5th grades and will probably have 5th grade next year. She has already prepared posters with all elements, standards and character traits. She has an initial plan of how she will introduce and reinforce the concepts (through literature) and she will detail and finalize these plans this quarter as her "practicum project". Her final product will be a curriculum for introducing and reinforcing the concepts of the dimensions of critical thinking. She said that it wasn't until she saw the "Critical Thinking for Children" publication that she could conceive of how to teach the information to her students.